I’m so ambivalent about our relationship. There is laundry that I didn’t do. Tax papers not yet filed. And, heaven help me, work that I should have finished already. Then I start thinking about you, and all I want to do is read poetry, look at art, even make some myself. This is our dilemma! Will you rescue me from the mundane? Or tumble me into utterly paralyzed blankness? It all depends. You’re moody. And don’t try to deny it. Don’t think that I’ve forgotten how you made me struggle to figure out what makes you different from the surrealists. Or my painful confusion over how you could have come before them, when I think you should have been the clean sweep that came after their authoritarian and frequently baroque immoderation. But it’s only fair to acknowledge that I, too, can be harsh, have sometimes been certain that you and your heroes have nothing to offer but a cynical art-star glamour. So, you might ask, why am I writing? Well, fact is, you still inspire me. And I’m not alone. Exhibit A, Maintenant 6, one-hundred-and-twenty artists and writers, gathered in your honor. Page one is an anonymous graffiti found in Corsica: “Tout est Dada” (Dada is everything). Maybe it is. Maybe you are inescapable. And maybe I don’t mind. 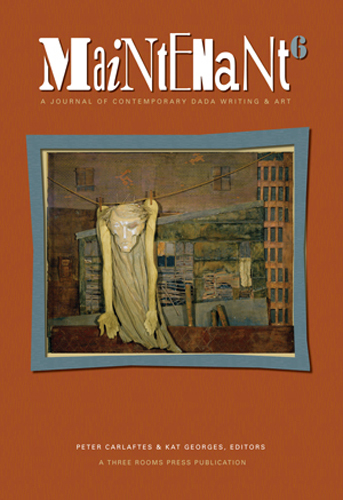 Maintenant – A Journal of Contemporary Dada Writing & Art appears in print only, and only once a year. The quality is excellent. I know you’ll appreciate the size, just big enough to see everything, just small enough to keep it from looking like something you’ve subscribed to that arrives in your mailbox weekly. Peter Carlaftes and Kat Georges, who also handled design and production, are the editors. I’d describe them as curators, skillfully balancing the images and text to create an exhibition you can hold in your hands. Considering the complexity of language throughout, the twists and turns and unexpected line breaks, the layout is impressively clear. I wish, however, that there were titles in the TOC, so it’s easier to find a piece again if you don’t remember the artist’s/author’s name. Would also like to know what media were used in the artwork. Speaking of language, it’s not always English. So something like the caption for Irene Caesar’s intriguing photo – “In Principio Erat Verbum” – might require a visit to your preferred search engine to find out that it means “in the beginning was the word.” There’s also plenty of English at play: nonsense words, rhyming words, letters and symbols in juxtaposition. Sometimes with a message: “Declare art on war / the spray can is mightier than the sword / defend yourself with words / and declare art on war.” (Mandy Maxwell, Declare!) Sometimes not words at all. Silly, annoying, beautiful. Don’t ask me why, but I love looking at Remorse Re-Morsed – William Shakespeare’s Sonnet CVIII, in which John J. Trause presents the poetry in Morse code. “Maintenant” is French for “now.” Yes, I checked, and am glad I did, because I found out that, as a verb, it means uphold, maintain, sustain, preserve, protect. As we all know, Dada, you’re not always a bowl of cherries. Ditto for the work in Maintenant. But the feeling I’ll remember is having visited with friends, and a daffy sense that something deceptively light, offhand, baffling can really be a life preserver. 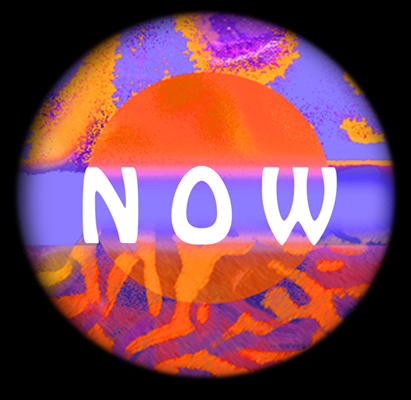 This entry was posted in Introductions & News and tagged contemporary writing and art, Dada, Maintenant 6, Three Rooms Press. Bookmark the permalink. To Jesse S. Mitchell, many thanks for the like!! Wonderful to see the Three Rooms link!! And a scintillating Sunday to all.